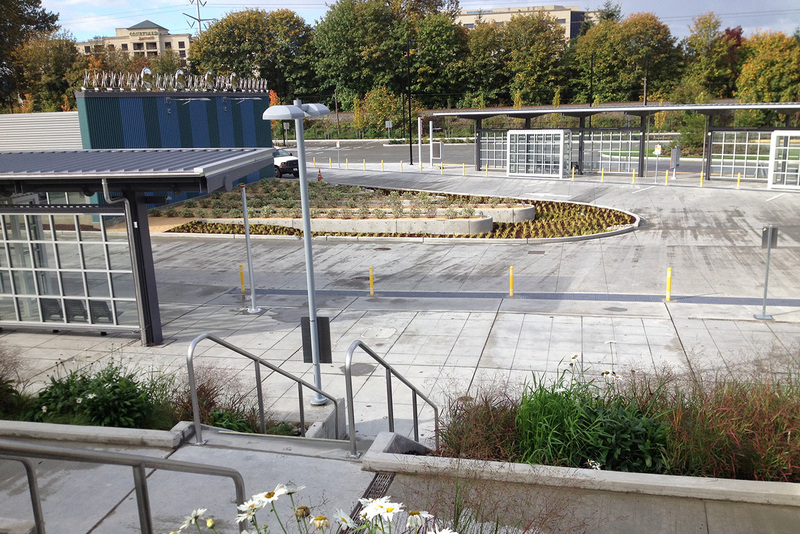 The project is sited on the soft triangular space created by the roadways into the station and adjacent to the ancillary building. The objective of the piece is to make a signature entry using landscape, light and sculpture. The piece is meant to be theatrical and a backdrop to the nature of travel. The piece is working off of formal garden concepts. These gardens that include dramatic graphic devices, edged beds, strong geometries and playful site lines. This project aims to do this with a contemporary feel. The piece can be enjoyed on an intimate or a territorial level, having both daytime and nighttime personalities. It is viewed from vehicles, the tracks, bus stop, and parking area. The piece elevates an otherwise utilitarian building, leveraging both the art and the architecture create an identifiable sense of place. This multidisciplinary piece collaborates with the team members within the area of architecture, landscape, engineering, drainage and art. Five rows of raised beds are placed in relationship to the ancillary building. There is a single row of Red Twig Dogwood in each bed. These durable shrubs sit within 5 ft wide bed described by a curb that separates it from the bio retention area which is at a lower grade. 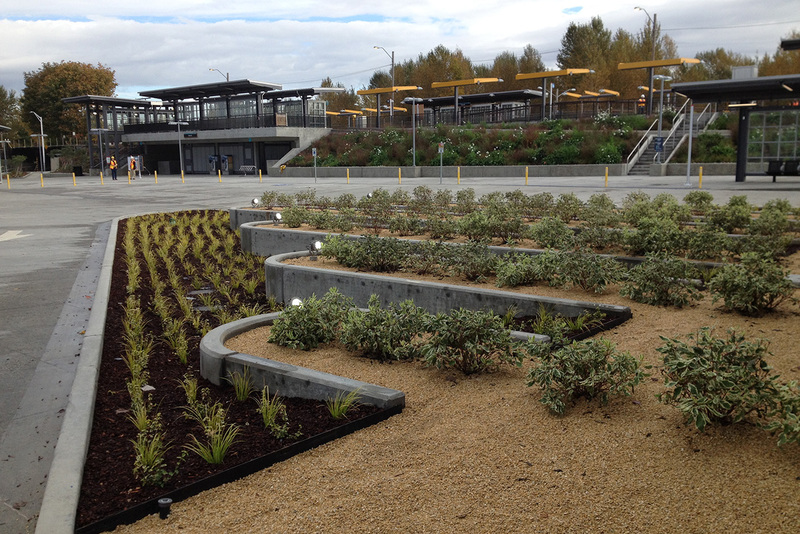 The planting bed curbs are 6" above the roadway perimeter. The curb makes a crisp border to contain the shrubs, the earth between the finger beds are depressed below these beds. 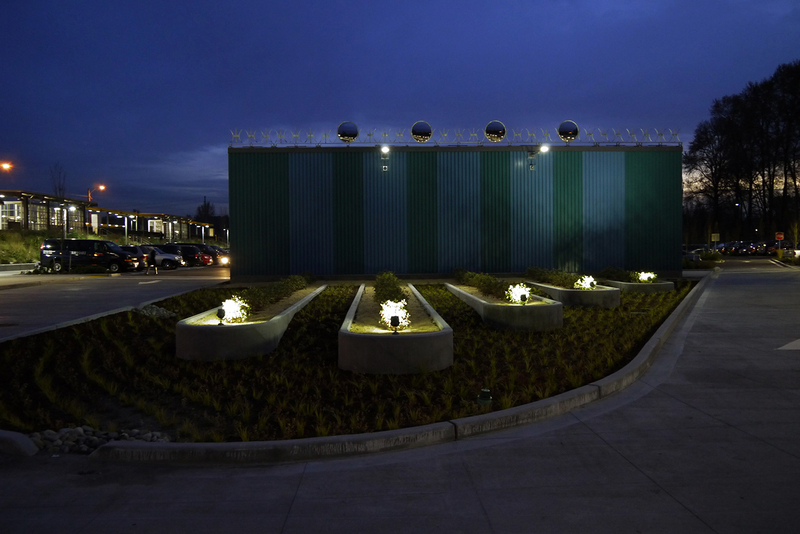 These lines of shrubs are placed against the ancillary building and uses the building as a backdrop. The bed containment system will be poured in place concrete curb. The 5-wide bed is comprised twig dogwoods with crushed rock on top. The first layer of the bed is a weed barrier material. 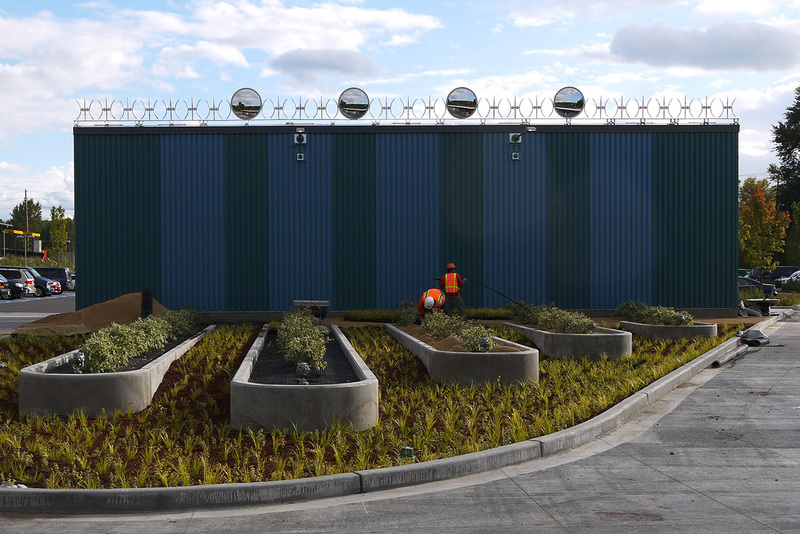 In the earth In between the rows there is a grade change to provide the necessary drainage needed for the site and to heighten the effect and make the mulch beds more effective both for optimal visibility and durability and drain-ability. Curbs will be a consistent 6" height above roadway perimeter curb. 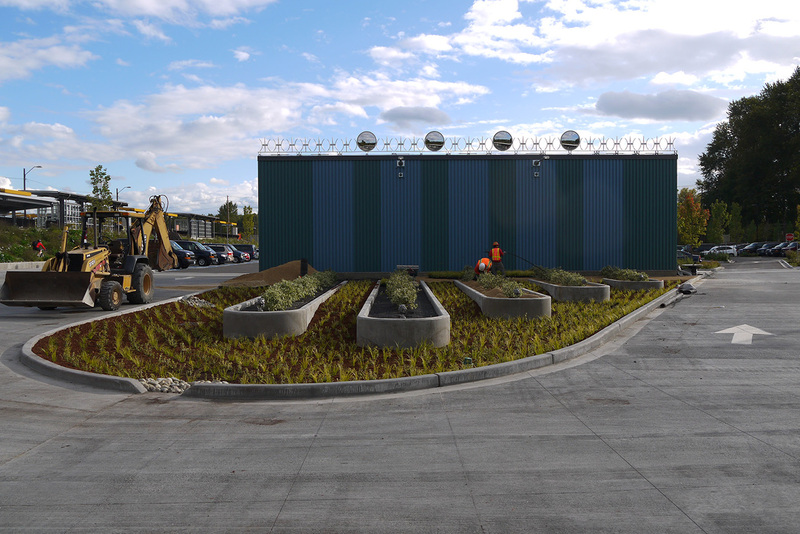 The 5 locations where the planted raised beds hit the building will be a different color(blue), and serves as a backdrop to the piece. The lines of shrubs are lit in a dramatic way increasing the theatrical nature of the piece. On the roof is a crown /marquee that frames the piece, This articulated metal edge provides interest in the sky scape. The crown is handmade blacksmithed stainless crafted here in our studios. There are four 36” safety mirrors within the crown. They are double-sided and will reflect the sky/surroundings. The metal piece is 60' long and ranges from 36” tall to 24” tall. The crown edge adds to the theater of the piece, it provides a 60' linear sculptural element that is seen from all around the station. This minimal yet expanded graphic idea is meant to both soften the site, add energy, color, and enjoyment for the riders. Formal ideas about color and form are played out in large scale. This will enrich the experience of arriving or departing from the station.